When NAFTA was passed two decades ago, its boosters promised it would bring “first world” status for the Mexican people. Instead, it prompted a great migration north. In Oaxaca, for example, some towns have become depopulated, or now consist of communities with only the very old and very young, where most working-age people have left to work in the Global North. Indeed U.S. trade and immigration policies are linked. They are part of a single system — not separate and independent. Trade negotiations and immigration policy were formally joined together by the Immigration Reform and Control Act (IRCA) of 1986. The negotiations that then led to NAFTA started within months. NAFTA, however, did not produce rising incomes and employment in Mexico, and it did not decrease the flow of migrants. Instead, it became a source of pressure on Mexicans to migrate. The treaty forced corn grown by Mexican farmers without subsidies to compete in Mexico’s own market with corn grown by huge U.S. producers who had been subsidized by the U.S. government. 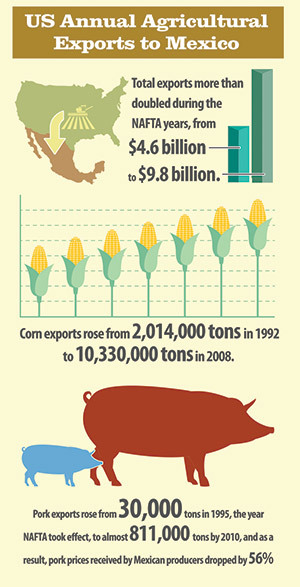 In fact, agricultural exports to Mexico more than doubled during the first year of NAFTA. NAFTA also prohibited price supports, without which hundreds of thousands of small farmers found it impossible to sell corn or other farm products for more than it cost to produce them. Once free-market structures were in place, prohibiting government intervention to help them, those farmers paid the price. Campesinos from Veracruz, as well as those from Oaxaca and other major corn-producing states, joined the stream of workers headed north. There, they became an important part of the workforce in U.S. slaughterhouses and other industries. According to Garrett Brown, head of the Maquiladora Health and Safety Network, the average manufacturing wage in Mexico was 23% of that in the U.S. in 1975. By 2002, however, it was less than 12.5%. Brown says that, after NAFTA, real Mexican wages dropped by 22%, while worker productivity increased by 45%. The rosy predictions of NAFTA’s boosters — that it would raise incomes and slow migration — proved false. The World Bank, in a 2005 study for the Mexican government, found that the extreme rural poverty rate of around 37% in 1992-1994, prior to NAFTA, jumped to about 52% in 1996-1998, after NAFTA took effect. In the U.S. political debate, Veracruz’s uprooted coffee pickers and unemployed workers from Mexico City are called “immigrants,” because that debate does not recognize their existence before they had left Mexico. It is more accurate to call them “migrants,” and the process “migration,” since that takes into account both their communities of origin and those where they travel to find work. Since NAFTA’s passage in 1993, the U.S. Congress has debated and passed several new trade agreements — with Peru, Jordan, Chile and Central America. At the same time, Congress has debated immigration policy as though those trade agreements bore no relationship to the waves of displaced people migrating to the U.S. looking for work. Meanwhile, heightened anti-immigrant hysteria has increasingly demonized those migrants, leading to measures that deny them jobs, rights, and any equality with the people living in the communities around them. To resolve any of these dilemmas, from adopting rational and humane immigration policies to reducing fear and hostility toward migrants, the starting point must be an examination of the way U.S. policies have produced migration — and criminalized migrants. But “displacement” is unfortunately an unmentionable word in the Washington discourse. 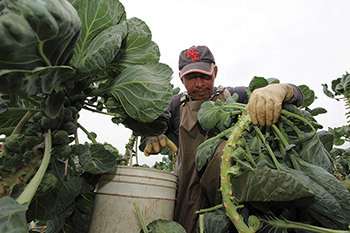 Not one immigration proposal by Congress in the quarter century since IRCA was passed has tried to come to grips with the policies that uprooted miners, teachers, tree planters, farmers and other workers. In fact, while debating bills to criminalize undocumented migrants and set up huge guest worker programs, four new trade agreements were introduced, each of which has caused even more displacement and migration. Note: The ideas herein were developed from David Bacon’s book, The Right to Stay Home: How U.S. Policy Drives Mexican Migration (Boston: Beacon Press, 2013).